International departure taxes of $201 plus current fuel surcharges of $300 are included (subject to change). Today, we depart El Paso to connect with our transatlantic overnight flight to Munich aboard a wide-bodied jet. We enjoy in-flight movies, dinner and breakfast aloft. This morning, we arrive in Munich, capital of Bavaria where we are met and enjoy a delightful orientation tour of the city. After, we check into our hotel for dinner and overnight. The balance of the day is at leisure. Following breakfast, we begin our tour of Munich. We pass the Olympic village and stadium, along the Leopoldstrasse with the Triumphal Arch and Hall of Generals; see the Theatiner Church and Residence Palace. A visit to the Nymphenburg Palace and a stop to see the famous Glockenspiel at the new Gothic City Hall. We celebrate Mass at the Frauenkirche, the Cathedral of Munich. We have time for shopping and personal adventure. Tonight, we explore the culinary delights of Munich as dinner is on our own and perhaps experience one of the many Munich Beer Gardens. Overnight at our hotel. This morning we travel to the delightful little village of Altotting once the favorite of dukes and princes, nested in the spectacular Bavarian countryside. We visit the Bavarian Pilgrimage Center, home to Our Lady of Altotting and the amazing Black Madonna. It stands with Lourdes, Fatima and Einsiendein as one of the famous Marian Shrines. We celebrate Mass here before we continue on to visit the Eucharistic Miracle of Erding, and Ottobeuren Abby before returning to Munich for dinner and overnight. We have an early departure this morning and make our way to the Pilgrimage Church of Wies where we celebrate Mass before continuing to Oberammergau mid-morning. We arrive in the famous Passion Play village where we transfer to our accommodations. Following lunch on our own we can visit the Oberammergau Museum or simply walk among the many craft shops. We then head off to the Theatre. In the middle of the Thirty Years War, after months of suffering and dying, as a result of the plague, the people of Oberammergau vowed to perform "The play of the passion, death and rising of our Lord Jesus Christ" every ten years. At Whitsun 1634 they kept their promise for the first time, on a stage which they had set up in the cemetery, over the graves of those who had died of the plague. 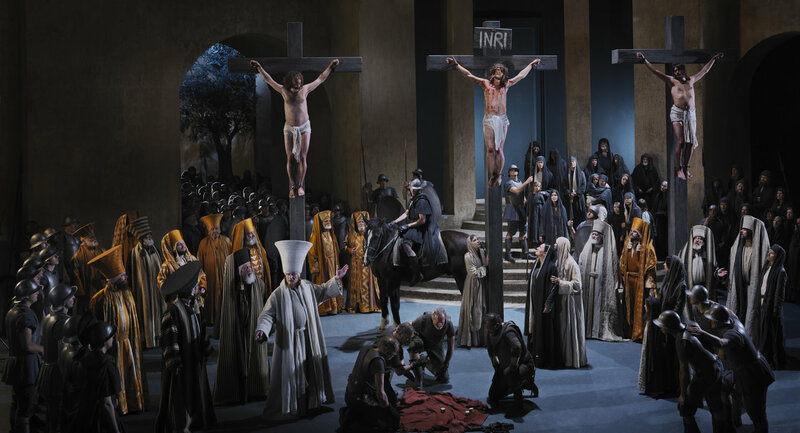 In 2020 Oberammergau will, for the 42ndt time, be putting on the play that has been carried on over the centuries in a unique continuity. The play shows the story of Christ's Passion, beginning with the entry into Jerusalem and ending with the resurrection. The structure of the play is living pictures from the Old Testament and acted scenes from the New Testament. The Play employs a large choir and orchestra. Our performance runs 2:30 to 5:00 PM and after a 3-hour dinner break it concludes 8:00 to 10:30 PM. After our included dinner we return to view the conclusion of the play. Overnight in Oberammergau. This morning we visit the famous Neuschwanstein Castle located just 45 minutes outside of Oberammergau. The Castle, which inspired Walt Disney for Disneyland’s iconic castle, was built by the shy King Ludwig II in order to withdraw from public life. Now this famous castle welcomes nearly 6,000 visitors each day. From here we visit Linderhof Palace the smallest of the three palaces built by King Ludwig II (AKA Mad King Ludwig) and the only one which he lived long enough to see completed. We continue to Salzburg, the ancient seat of the Archbishop, and the location for the Sound of Music, for dinner at our hotel and Overnight. Salzburg is said to be the geographical center of Europe. The town, lying on both sides of the Salzach River, and encircled by the awesome Alps, is a delight to its visitors. Following Mass in the Dom, (cathedral) our sightseeing includes a visit to Hohensalzburg Fortress Castle. We see the old town with its ancient, gingerbread ornamented houses, “the narrow street,” the Residenz, whose melodic glockenspiel carillon chime three times daily as in the days of the prince-archbishop. We see the Festival Hall and charming St. Peter’s churchyard. In the “City of Mozart,” we also visit the birthplace of the great composer. This afternoon, heavenly sights enthrall us again as we motor through one of Europe’s most eye-appealing areas the Salzkammergut, photogenic backdrop for the film, “The Sound of Music.” We see storybook, old world villages, mountains rising from crystal clear lakes, fir forests merging with green slopes and meadows dotted with wild flowers. Dinner and overnight at our hotel. This morning, we motor northeast to Melk where we visit the towering, architecturally superb, baroque Abbey of Melk. We celebrate Mass here and if possible, join the monks of Melk for their sung noon service. We continue with our scenic drive to Vienna where the afternoon is free to explore on your own. Perhaps take in the Beethoven Museum, or gaze at the amazing works of art by Gustav Klimt. Tonight, we enjoy a typical Heurigen. Dinner before our overnight stay at our hotel.